If money with our consumer increase to Rs. II<, the price line will shift to P.Q. For with Rs. 18, he can buy either 12 mangoes (= OQ) or 18 apples (= OP). 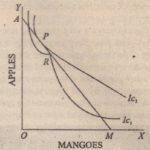 prices of mangoes and apples. remaining the same. It may be carefully noted that, since prices of mangoes and apples remain unchanged, will be parallel to AM. If the total amount of money (Rs. 15) and price or apples (Re, I per unit) remain the same but the price or mangoes falls from Rs. 1.50 to Re.1 per unit, the price line will shift from AM to AU. All will he parallel to AM because the price ratio has changed. 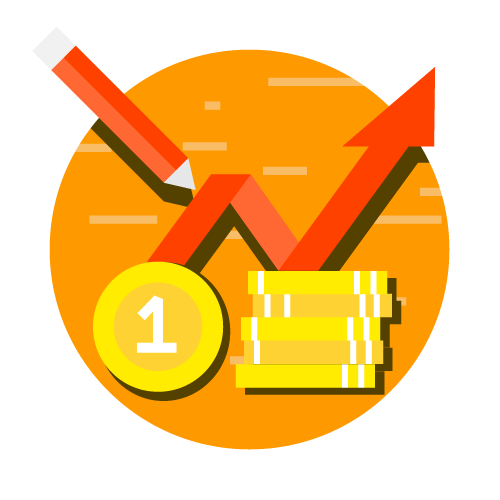 From the above, it follows that the shape and the position of the price line will depend on two factors : (1) the total amount or money a consumer has for purchasing goods; and (2) price ratio of the goods in market. 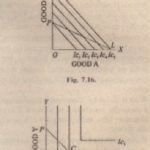 The slope of the price line may be distinguished from the slope of the indifference curve. 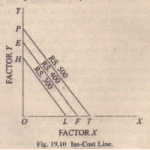 The slope of the price line is (the negative of ) the price ratio, i.e., the ratio of the price of X to the price of Y. But the slope of the indifference curve at any point ‘is called the marginal rate of substitution of X for Y. The marginal rate of substitution gives the rate at which the consumer is willing to substitute X for Y. whereas the price ratio shows the rate at which he can substitute X for Y.